Click HERE to see all our ACE FUND winners. In addition to rewarding a player who makes a hole-in-one, the ACE FUND also supports programs of The Pro Kids | First Tee of San Diego. Half of the pot goes to the ACE player and the other half goes directly to Pro Kids. The ACE FUND is ongoing, per-round promotion. The pot grows until there’s a winner and re-sets each time there is a winner. However, promotion is subject to end at any time after a win. Entry is $2 per player per 9- or 18-hole round (in addition to greens fees). If you choose to play more than 18 holes in a day, you must enter again for each separate 9- or 18-hole round. Entrant will receive an “ACE FUND” receipt with the date/time entered. Receipt must be presented to receive payout. No receipt, no win. To win, an entered player must score an “ace” or “hole-in-one” (first stroke) on any regulation size golf hole at Colina Park Golf Course. The 15-inch Big Cup Golf holes do not count. The shot must be witnessed by another player in the same group (not bystanders, players in other groups, or any Pro Kids or Colina Park Golf Course employee). Immediately after the hole-in-one, the player can call 619-255-4425 or come in the pro shop to report the ACE and present entry receipt. If more than one ACE occurs at virtually the same time/same round, the player who records the first ACE by the time of day it occurred will win the pot. There are no split pots between players. After the round, the player and the witness must come in the pro shop together and present the entry receipt. Both will sign a form with names and contact information, and a release allowing use of winner’s name and/or photo by Colina Park for promotional purposes. Amount in the ACE Fund pot will be actual amount collected in ACE fund between winners, even if a different amount may mistakenly be posted on the tracking board. Check with pro shop staff to confirm amount in fund at any time. 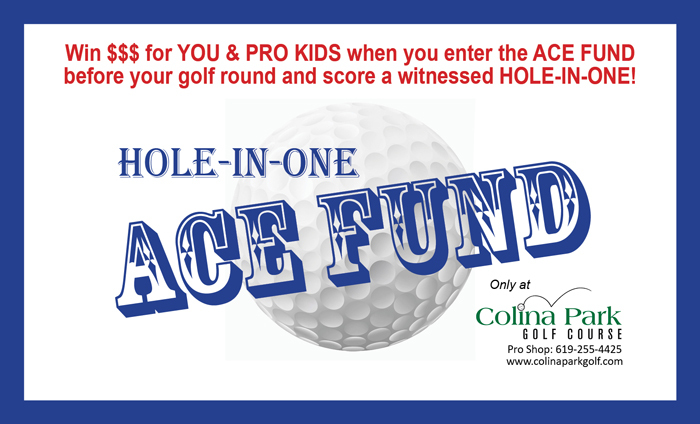 Colina Park will evaluate and, if needed, adjust payout prior to payment of any ACE fund winner. Payout is 50% of the total ACE FUND as of the time of win, and will be paid by check and mailed to winner within three business days after the hole-in-one (If $600 or more, winner must supply SSN for 1099 form). Remainder 50% of the ACE FUND goes to Pro Kids, but is not considered a donation by the winner. If the winner chooses to donate all or a portion of their winnings to Pro Kids | The First Tee of San Diego, it is tax-deductible and a form will be provided. A hole-in-one without paid ACE FUND entry before the specific round is not eligible. All participants must be age 18 or older. If a player is concerned about losing amateur status (according to the USGA rules) please do not enter.